Is it any wonder that their enrolment is crashing? What parent would send their child to this cesspool of hate? 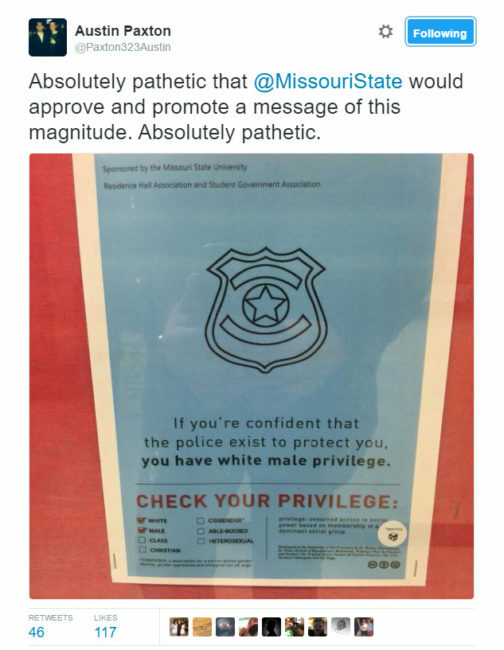 A poster campaign at Missouri State University sought to privilege-shame students for being straight, white, male, Christian or able-bodied (among other characteristics) and informed students that the police only exist to protect white men. The posters were sponsored by the university’s student government and Residence Hall Association (RHA) and reportedly went up inside a dorm Saturday morning before being removed on Sunday night in the face of backlash from students on Twitter. The Daily Caller obtained pictures of six of the posters from an MSU student before they were taken down. Each poster included an example of “privilege” above the phrase “Check your privilege” and a checklist of different categories of privilege, including: Christian privilege, class privilege, white privilege, male privilege, able-bodied privilege, cisgender privilege and heterosexual privilege.